Thank you for visiting! This is a community-powered webpage, helping volunteers and aid connect with those affected by Tropical Storm Irene. In the bar on the left, you will see a link to our RESOURCES page, and an updated list of our needs at the Volunteer Command Center. If you want to make changes to the page, just email northfield@recovers.org. Fill out this simple online form - list anything you are able to offer. We'll call you when we have a job for you! If you were affected by the storm and need assistance, please fill out this simple online form and we will do our best to match you with volunteers/donations. 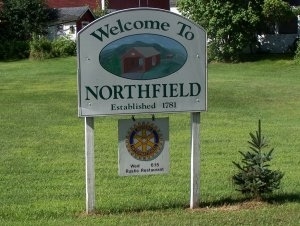 Please mail or deliver cash/checks to the Northfield Savings Bank, PO Box 347, 33 South Main Street, VT 05663. Please make checks out to "Northfield Emergency Relief Fund." Make t-shirts and sell them with all proceeds going to the Northfield Emergency Relief Fund. Sell them at local businesses and advertise them on Facebook, and to friends and relatives who live far away. Make 'Northfield Unites' wristbands and sell them to raise money as well. These sell fast! You can also sell them at the volunteer table. Advertise these items on this website: Email northfield@recovers.org and we'll help you post it! Note: Rich Huebner has constructed a more frequently updated recovery webpage, accessible at http://www.db-geek.com/floodrelief/. Volunteer information entered on either site will be forwarded to the Command Center. For a complete list of resources, please click the "Resources" link at the top left of this page.